Kat's Food Adventures: GIVEAWAY ALERT: Subway - 12 Days of Thanks! GIVEAWAY ALERT: Subway - 12 Days of Thanks! 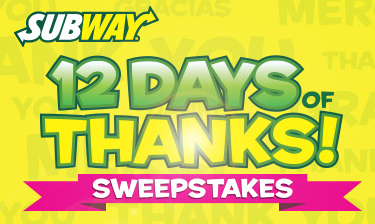 Check out Subway's 12 Days of Thanks Sweepstakes! Check out all the official rules.